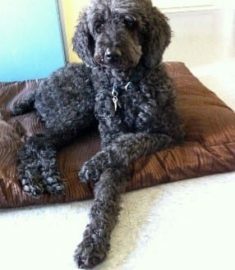 We adopted our beloved standard poodle “Jackson” when he was 7 years old. He is our first pet and really more a ‘fur baby’. He not only fills our life with joy but that of my mother and father who live next door and “dog sit’ during the week. Two years ago Jackson had a health scare where I found myself preparing for the day that I might have to euthanize him. I woke up one morning and Jackson was not his usual self, he did not greet me excitedly and rub up against my leg, but rather looked at me with a scared gaze and his head titled sideways. The vet did a battery of tests and I was told that we had to rule out a potential tumor in his head. As Jackson was undergoing tests to rule out cancer, I prayed, and searched the internet quickly to see what in the world could I do to preserve this incredibly calm, gentle, smart, loving animal. I came upon “ViaGen Pets”, the rest is history. I was immediately excited and comforted that there was an option to keep Jackson’s qualities and spirit around. Jackson’s scare turned out to be an infected (tooth) a cavity in one of his upper molar which was fixed. I am grateful knowing that your services exist and are available to pet lovers. I am currently setting aside income in order to be able to one day be able to bring back our beloved Jackson in the future.